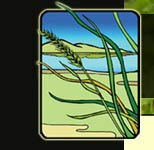 Native plant population ecology: in conjunction with the California Native Plant Society and the California Native Grass Association we are working to develop a database of information on the genetic diversity of native plant populations in order to provide ecologist with new tools for planning restoration projects. Invasive non-native plant control: in support of the California Exotic Pest Plant Council we are researching non-chemical techniques for eradicating exotic pest plants from coastal ecosystems. Integration of native plants into agroecosystems: working with the Natural Resources Conservation Service and the Community Alliance with Family Farmers we are developing applications of native plants in windbreaks hedgerows and critical areas within agroecosystems. Medicinal qualities of native plants: in cooperation with professional herbalists we are developing educational material on the sustainable use of native plants species in the preparation of medicinal products.